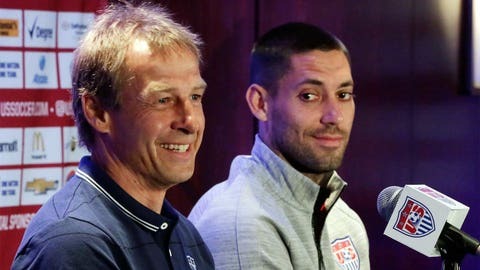 Clint Dempsey and Jurgen Klinsmann speak at media day. NEW YORK - The epicenter of the world’s media capital sported the colors of US Soccer. Times Square, the beating heart of New York City’s unmatched concentration of media, was adorned in red and blue, some white, US Soccer logos and giant images of Clint Dempsey. Scads of fans wore generations’ worth of United States men’s national team jerseys. One woman sported a hand-drawn "Mrs. Diskerud" t-shirt. Walking along 42nd street in Manhattan and hooking a right on Broadway on Friday afternoon would put you right into the middle of it: US Soccer’s quadrennial pre-World Cup media day. In anticipation of a ‘pep rally’ fans had converged in front of the stage where ESPN would broadcast a live edition of its soccer show before a rapt and loud audience. In tents, sponsors gave away red, white and blue freebies, including the cutouts of the blown-up faces of several players. Unbridled optimism abounded. With two weeks and three days to go until the USA kicks off its World Cup, everything still seemed possible - a hopeful high-spiritedness akin to baseball’s Sprint Training. It all felt like a critical mass had been reached in soccer’s slow climb to securing a lasting place in our society’s fabric. US soccer had taken America’s busiest intersection, the cross-section of American life. After all, if female fans had started making their own jerseys proclaiming themselves the wives of fairly little-known midfielders - Mix Diskerud, in this case - that is surely hard evidence that the larger public had taken note. At the very least, the mainstream media has. On Friday, members of Team USA made appearances on Good Morning America. And in addition to featuring on the covers of Sports Illustrated and ESPN The Magazine, as they do before every World Cup, the Yanks had also featured in major generalist magazines. Men’s Journal had put Clint Dempsey, Michael Bradley and Omar Gonzalez on the cover. Word has it a few other top tier magazines’ front pages will be adorned with American national teamers in the coming weeks. And the team received a lengthy write-up in GQ. For a few weeks, the little old men’s national soccer team could dominate the newsstand. • Video: Beginning of a German dynasty? • Video: Is Messi's legacy now tarnished? The main event, however, was a press conference in a large hotel ball room with head coach Jurgen Klinsmann and a chance for all 23 team members to meet face-to-face with reporters. More than a hundred journalists turned up, from all manner of countries, in addition to three dozen or so television and photographers’ cameras. There were a lot of inane questions. There were a lot of softball questions - "How excited are you? " And there were a lot of hometown questions – "How excited are you to be home? " But what was really relevant here, the clearest sign of the upwards trajectory American soccer continues to plod, was the sheer volume of questions. That so many people cared. Star midfielder Michael Bradley was surrounded by a clusters of reporters so thick that many of them stood on chairs just so they could see over the gaggle and look down at him. Even backup goalkeeper Brad Guzan was answering questions from the very second he stepped into the room until his last stride out of it. "We’ve seen an extraordinary increase in interest in and around the team," said US Soccer president Sunil Gulati. "It shows three different things. It shows the power of the World Cup; it shows the power of the sport more generally; and it shows the increased awareness and interest in the US team. Probably from ‘90 to ‘94 there was a pretty steep growth rate because of the World Cup [on American soil] but this is I think probably the biggest since then in terms of media exposure and media interest, internationally and domestically." "I’ve never seen it this big, maybe because it’s all in one day," added veteran defender DaMarcus Beasley, who is off to his fourth World Cup. "It’s great that it’s not just soccer media. It’s worldwide and mainstream. It says our sport is growing in the right direction when everybody wants to talk to a young guy like [18-year-old winger] Julian Green and see what he’s all about." Relive Team USA's previous exploits in past World Cup tournaments. A major contributor to the interest - as well as the residue of it - is a new willingness from the private sector to advertise through the US’s soccer stars. Increasingly, commercials and billboards feature the likes of Dempsey, Bradley and goalkeeper Tim Howard. "Along with all the media attention we’ve had from non-sports media, we’ve seen our sponsors activate around our team and our players in a hugely increased capacity," said US Soccer spokesman Neil Buethe. "It blows it out of the water compared to four years ago. We’re finding ways to get into the mainstream American public in more and better ways." The question is often asked when soccer will truly "arrive" in the United States. The sport has been building momentum for some time now. And days like Friday, even if they occur on just one day every fourth year, suggest it may already be here.